An ingrown toenail, medically known as onychocryptosis, is a quite common condition. It occurs when the side edge of the nail begins to dig into the toe’s skin. The nail can break through the flesh and cause various symptoms like inflammation and pain. This problem generally occurs in the big toe. However, other toenails or fingernails may also become ingrown. From minor discomfort to constant pain, the condition may vary in its severity depending upon the stage it is in. In its early stage, an ingrown toenail can be treated effectively at home. If the affected area becomes infected, it is best to consult your doctor. Serious cases may also require surgical intervention. Several factors may lead to this problem. Here are a few common causes of an ingrown toenail. High-heeled or tight shoes that put too much pressure on the toes. Improper cutting of the toenails. An injury, such as dropping something heavy on your foot, repeated kicking or stubbing your toe. Deformities of the foot or toes. Health conditions like diabetes, arthritis, and obesity may also increase the risk of developing an ingrown toenail. The symptoms associated with an ingrown toenail may vary depending upon the severity of the condition. The skin around the affected area becomes swollen and tender. Pain when exerting pressure on the toe. Skin overgrowth around the infected toe. This utterly discomforting problem rarely goes unnoticed. Chances are you will easily catch it in its early stage. Here are eight home remedies for ingrown toenail that actually work. 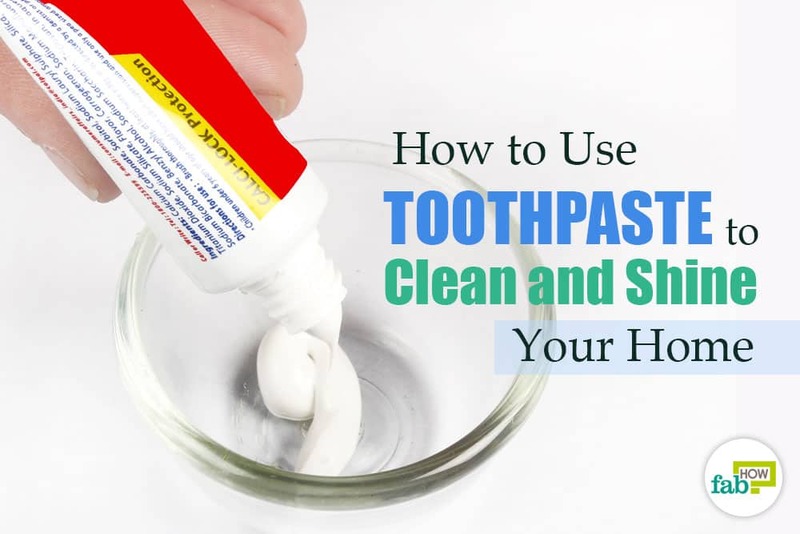 The ingredients used in these easy-to-follow remedies are inexpensive and widely available. Magnesium sulfate, commonly known as Epsom salt, offers a number of health benefits. It has soothing and healing properties. It can be used for relieving muscle cramps, treating sunburns, removing toxins from the body, easing aches and pains, treating foot pain and more. Epsom salt is a drying agent and also has disinfectant properties. 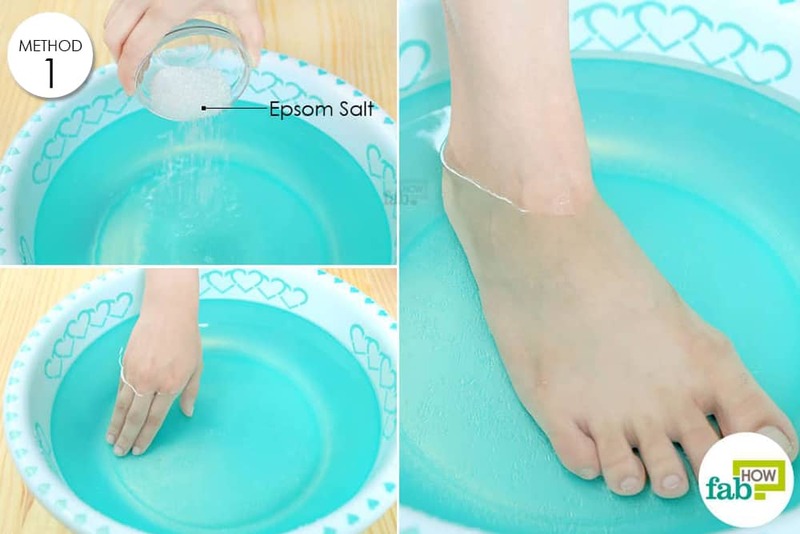 An Epsom salt soak will help soften the skin around the ingrown toenail, thus making it easier to draw it out from the skin. It will also help reduce inflammation and alleviate the pain. Fill up a small tub with warm water. Add ¼ cup of Epsom salt to it and mix well. Soak the affected foot in it for about 20 minutes. You can use this remedy 4 times a week. This ingredient is readily available at drugstores in a diluted form that can be safely used for natural home remedies. Fill up a foot tub with warm water. Soak the affected foot in it for about 30 minutes. Once finished, thoroughly pat dry your foot. For best results, use this remedy 2 times a day until the toenail heals. 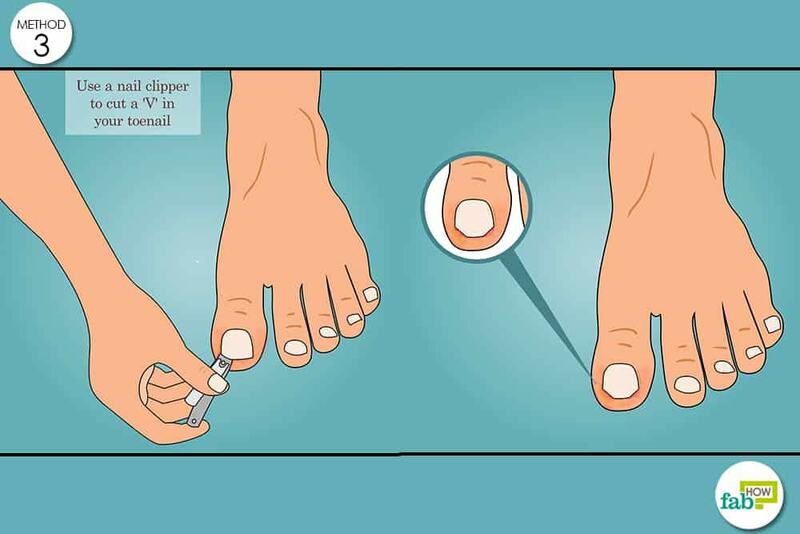 Turn the clippers to a 45-degree angle and clip the first side of the V into the middle of the toenail. The cut should be a small one. Make a similar cut in the opposite direction. The cuts should appear to meet each other in the middle. If you are unable to make them meet in the middle with a perfect V-shape, try clipping as much as possible from the corners. Leave your toenail with the V-shape cut for a few days. This will allow it to grow back as normal. Resume normal trimming once the toenail outgrows the V-shape cut. This method may cause a little discomfort, but the results will certainly be worth it. Soak the foot with the ingrown toenail in water for about 20 minutes. You may apply some clove oil on the corners of your toenail. Carefully place the dental floss beneath the edge of the toenail. Repeat this remedy several times a week to get rid of an ingrown toenail. Castor oil is commonly used for skin and hair care. It is rich in vitamin E, proteins, minerals, and several other beneficial nutrients. The ricinoleic acid found in this oil has antibacterial and anti-inflammatory properties. Castor oil can be used to treat spasms, cramps, muscle tension, warts, corns and more. It is one of the most popular home remedies for an ingrown toenail. It helps to heal the ingrown toenail by increasing the blood circulation and softening the skin around the affected area. This will allow the toenail to come out naturally. Use a cotton ball to apply some castor oil on the affected area. 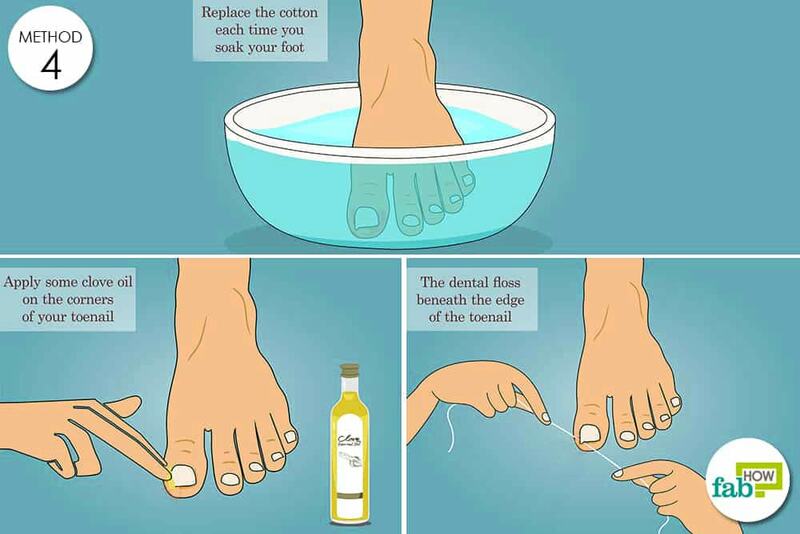 Use this method daily until the ingrown toenail is healed. You may experience some discomfort initially, but it will not last for long. Don’t apply too much pressure while pushing the cotton under the toenail. Go only as far as the inflamed skin allows. Soak the affected foot in a tub full of warm water. Use a pair of tweezers to gently lift the ingrown toenail and place a small piece of cotton under it. Replace the cotton each time you soak your foot. Use this remedy regularly until you begin to see results. The use of this menthol-based ointment has extended far beyond treating coughs and congestion. 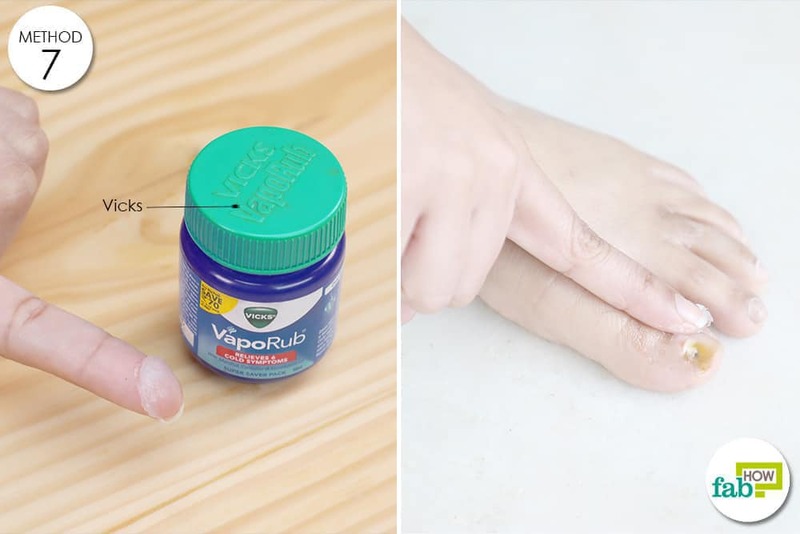 Vicks become the go-to solution for a number of problems like toenail fungus, insect bites, achy muscles, cracked heels and more. Gently apply Vicks on your ingrown toenail. Follow this remedy for up to 20 days to see the infection clearing up and healthy toenail growing back. Fill up a tub with warm water. Pour in about 15 ounces of apple cider vinegar and mix it well. Put the affected foot in the tub and let it soak for about 30 minutes. 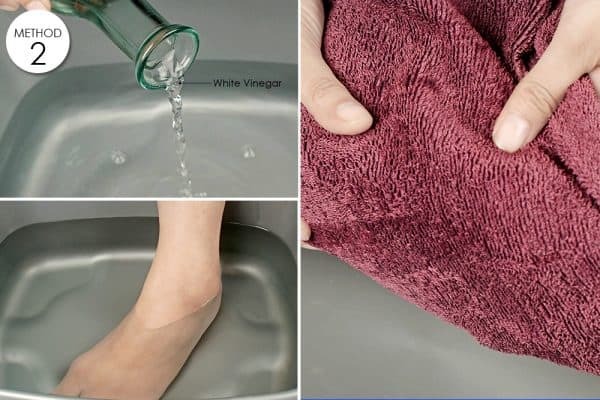 Use a towel to dry your foot thoroughly. 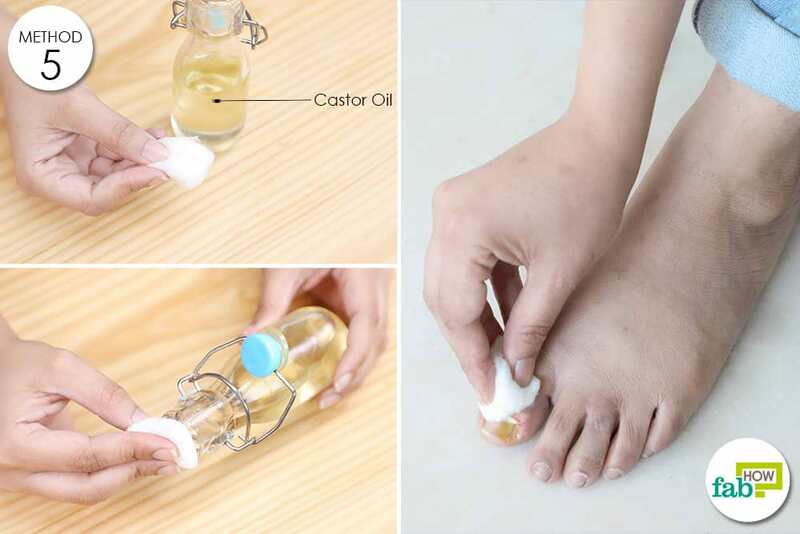 Use this home remedy for ingrown toenail daily until you get the desired results. Alternatively, you can soak a cotton ball in apple cider vinegar, put it over the affected area and use a bandage to keep it in place. Leave it on for 2 to 3 hours. Consuming apple cider vinegar will also promote the healing process. Mix 1 tablespoon of apple cider vinegar into 8 ounces of water. Drink it once or twice a day. Wear proper footwear that does not put pressure on your toes. Maintain proper foot hygiene. Clean your feet the correct way to keep them healthy. Avoid wearing shoes or socks at home. Exposing the affected area to air will accelerate the healing process. 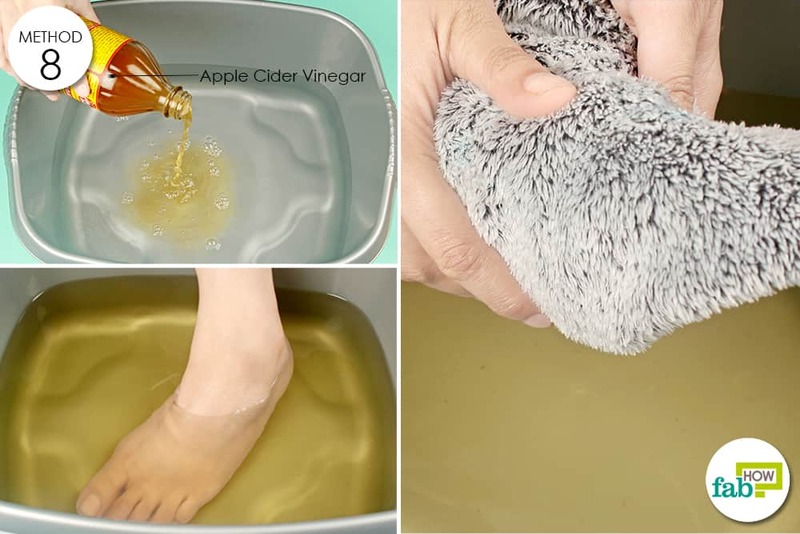 Scrub your feet regularly to get rid of dead skin from feet. Keep an eye on the affected toenail. Look for signs of an infection. Consult your doctor if needed. Trim your nails straight across on a regular basis. Rest is required to allow the affected area to heal. Goldstein BG, Goldstein AO. Management of ingrown toenails. UpToDate. https://www.uptodate.com/contents/management-of-ingrown-toenails. Published June 1, 2017. Heidelbaugh JJ, Lee H. Management of the ingrown toenail. American Family Physician. https://www.ncbi.nlm.nih.gov/pubmed/19235497. Published February 15, 2009. Authenticating apple cider vinegar's home remedy claims: antibacterial, antifungal, antiviral properties and cytotoxicity aspect. Natural Product Research Formerly Natural Product Letters. https://www.tandfonline.com/doi/abs/10.1080/14786419.2017.1413567?journalCode=gnpl20. Published December 11, 2017.